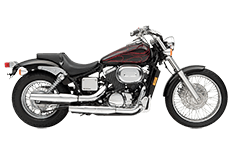 Like its big brother – the 1100 – Honda's Shadow Spirit 750 dc motorcycle is a true rolling beauty, therefore only the best in luggage design and functionality will suffice. We're proud to present the Viking Bags collection of saddlebags specifically for use with the Spirit 750dc. A perfect complimentary pair of bags not only looks great, but it keeps your stored luggage close at hand, protected from damage and safe from the weather. Step inside and see what you can find here, because we're confident you'll absolutely love our options!